Just wanted you to know that this tasty grilling recipe is sponsored by my friends over at Laura’s Lean Beef! 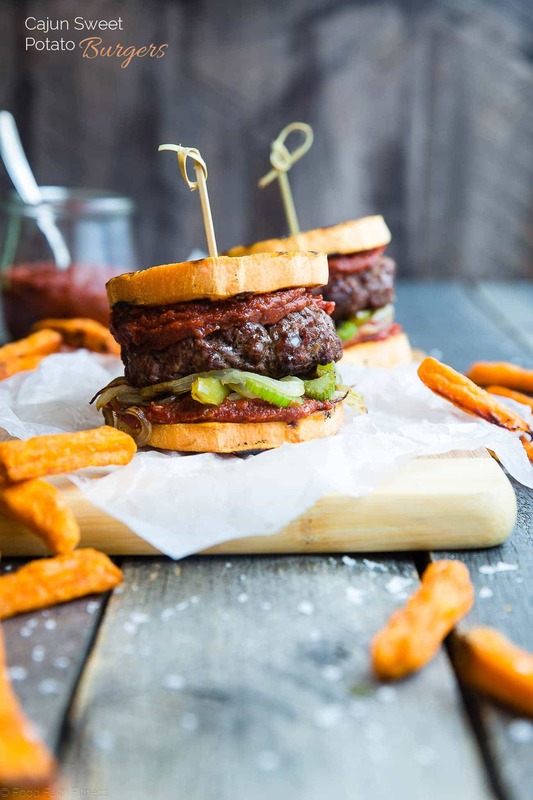 These Cajun burgers use grilled sweet potatoes as buns instead of bread! They’re a healthy gluten and dairy free summer meal with a taste of the south! After 4 years of blogging, I have FINALLY achieved the “VIP champion of the kitchen status” in the eyes of Mr. FFF. Like I told you in the Cajun Cauliflower Casserole and Cajun Cauliflower Tater Tots Casserole, Mr. FFF is OBSESSED with Cajun food, and he ALWAYS asks me to make Cajun flavored recipes. Then, when I do, I make them out of ALL of the vegetables and it makes him not so happy. I guess he wasn’t picturing cauliflower when he suggests these things to me. BUT, since he completed his first week of Nurse Anesthetist school – and lived – I decided to surprise him with CAJUN + BEEF. AKA: the very tune that his food-loving-Cajun-food-addicted-heart beats to. I meannnn, let’s not ignore that fact that I JUST HAD TO sneak vegetables in there, In the form of a SWEET POTATO BUN (!!!) but can we be mad at that? I mean they’re still carbs AND they’re about eleventy billion times more delicious AND nutritious than a bun. More on the sweet potato bun shenanigans in a sec. Let’s talk about DA BEEF. Specifically, this is All Natural Laura’s Lean Ground Beef! We’re talking DELICIOUS beef that comes from happy cows raised with no antibiotics or growth hormones. The cattle are also raised on a vegetarian diet of natural grasses and grains – no animal by-products being fed to them here folks! In addition, no additives, fillers or artificial ingredients are used in the beef. It’s simple, real food, and you can TASTE the difference in each VRY VRY juicy bite. Straight up. 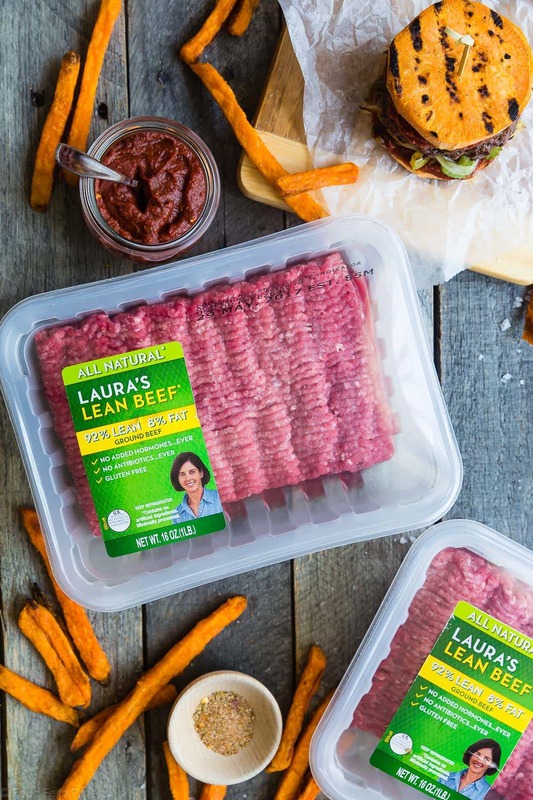 Laura’s Lean Beef is going to be both the CHAMPION of your heart and the champion of ALL your grill-outs, or tailgating shindigs, this Summer! 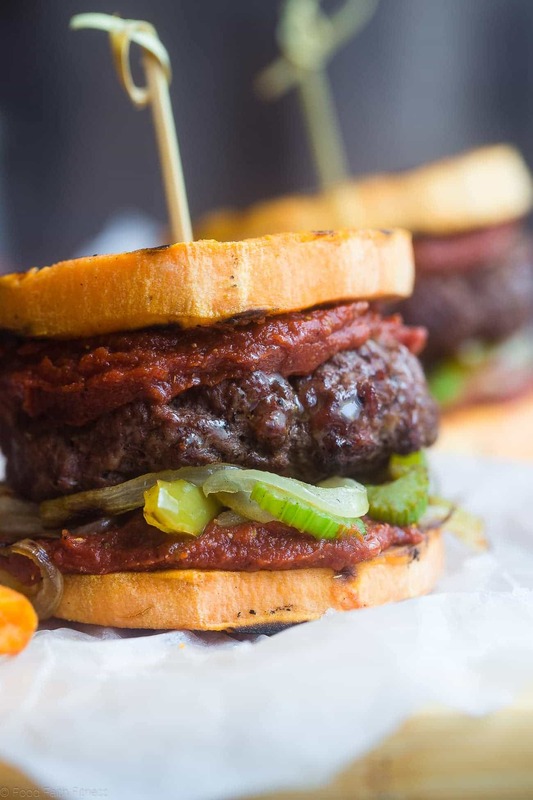 Especially when each tender mouthful is studded with garlicy, peppers and perfectly spicy Cajun seasoning and mish-mashes with that soft, tender potato and mingles with the subtle sweetness as you munch, munch, MUNCH through each bite of burger BLISS. Sweet potato buns. Prediction: you’re gonna dig ‘em. Internet friends, we can’t do a little Creole cookin’ without the holy trinity – peppers, onions and celery- am I right? Good thing a good burg’ is a combination of perfectly cooked, juicy beef and ALL. THE. TOPPINGS. Sautéing the vegetable trinity until they are all perfectly tender, with juuuust the right amount of crispy-crunch and piling them HIGH atop your natural, real-food burger is kicking up the Cajun vibes to 11 on a scale of 1 to GET IN MY MOUTH RIGHT NOW. Did you even know how SIMPLE it is to make your own, and without all the weird ingredients? This ketchup is made of a few pantry-essential, clean ingredients and is swirled with MORE Cajun seasoning. <– We are NOT skimping out my friends. It’s the kind of sauce that explodes out of your “bun,” and all over your face, right alongside the drippy, delicious beef, in a way that can only mean you are doing the summer burger eating VRY VRY right. The next time you grill, be prepared for a CAJUN INVASION. Pre heat your grill to high heat, letting it heat up at least 10 minutes. Heat the olive oil (for the veggies) in a large frying pan on medium high heat. Add in the pepper, onion, celery and garlic and cook, stirring frequently, until soft and golden brown, about 5-7 minutes. Keep on low heat to keep warm. Combine the ground beef, Cajun seasoning and salt in a large bowl and mix evenly. Form into 3 3/4 inch patties. Brush each side lightly with olive oil. Once the grill is on high heat, put the burgers over direct heat and cook for 4 minutes. Flip and cook an additional 3-4 minutes, or until they reach the desired level of done-ness. Transfer to a plate and cover to keep warm and let rest. Brush each side of the potatoes with the oil and grill until nice char marks form, about 4 minutes. Flip and cook and additional 3-4 minutes until fork tender, but not mushy. While the potatoes cook, mix all the ketchup ingredients in a medium bowl. Divide the ketchup between all 8 of the sweet potato slices. Divide the veggies between 4 of the slices, place one burger on top of each veggie-covered slice. Cover with the remaining sweet potatoes. *I am sure you could boil them too, but it would only be for 2-4 minutes or so. THIS POST IS SPONSORED BY MY FRIENDS AT LAURA’S LEAN BEEF. THANK YOU FOR ALLOWING ME TO CONTINUE CREATING GREAT CONTENT FOR YOU BY SUPPORTING PARTNERSHIPS WITH SUPER-FAB BRANDS THAT FOOD FAITH FITNESS LOVES TO WORK WITH! AS ALWAYS, OPINIONS REMAIN 100% MY OWN! It’s burger season and I’m always craving a delicious burger. I don’t usually care for the bun unless it’s really good, and these sweet potato buns look great! You would LOVE these I think 🙂 Thanks! The sweet potato buns are brilliant. The whole recipe looks delicious. Wow! These look amazing. Mouthwatering photos! Loving the combination of flavors here, especially on those buns. What an awesome summer burger! What a fun and creative use of sweet potato! That homemade ketchup looks awesome! Thank you! Allll about ketchup! This is a burger of my dreams!! Beautiful burgers and those buns, even as a non beef lover these are beautiful burgers. OMG, Taylor! These look so, so good. I love the idea of a sweet potato “bun.” We just started grilling sweet potatoes recently and I can’t get enough. PS – I love Laura’s beef. My mom started buying it when I was in high school and I’ve stuck with it. Isn’t it SO good Jordan? We love it too -and YES to sweet potato buns! Wish I was lighting up the grill now! 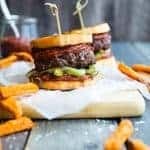 Love the sweet potato bun idea! Taylor! I do the same thing and don’t understand when the hubby, who loves cilantro isn’t happy when I make cilantro black bean burgers. He wants his meat! And he is going to love me even more when I make these! HAHA I knew I was not the only one who does this!! Hope he loves these Lorie! I love cajun flavors too. And I would definitely take the cajun cauliflower deliciousness that your hubby doesn’t want. 🙂 Loving the idea of sweet potato buns too! Haha perfect! Now I know where to send it 😉 Thank you! These look amazing! I love the sweet potato buns! Genius! LOL LOL! My hubby definitely doesn’t picture veggies when he requests a meal! But he’d totally be on board with this meaty goodness!! 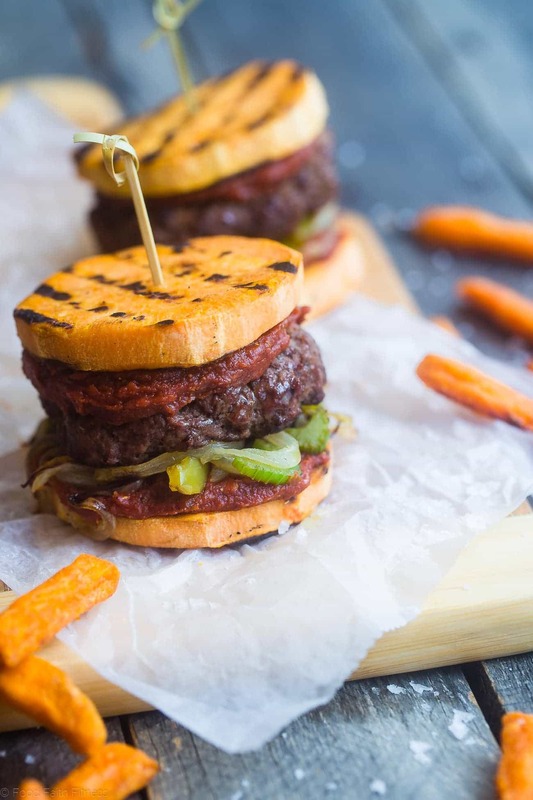 And I’m totally on board with using sweet potatoes as buns…genius! HAHA I don’t think MANY men do 😉 Thanks lady – you would love the tater bun I think! That is one awesome bun! What a FABULOUS burger! I truly can’t believe I’ve never thought to try a sweet potato bun. I mean, you’re kinda sorta a genius for this! Looks SO good- love the cajun burger, too! 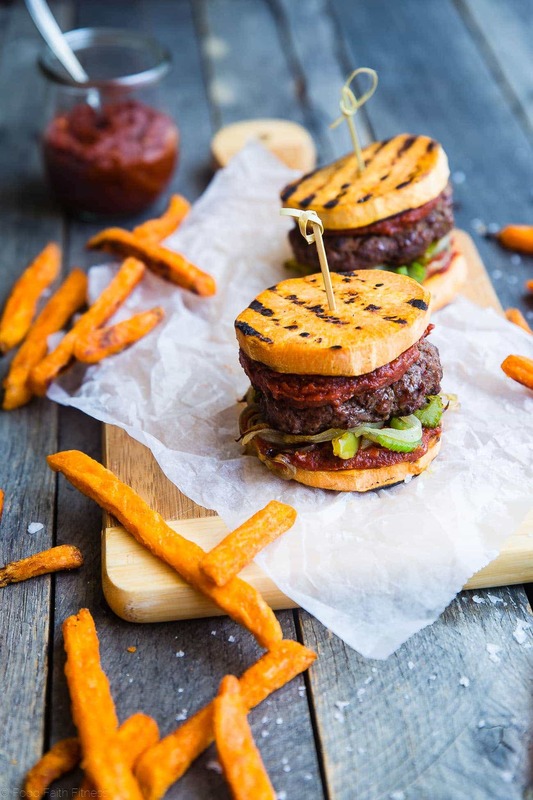 Love the idea of using sweet potato slices for buns! My husband will die for this recipe. Oh my! These sound and look so good! Dad’s all over will go crazy over them! I love Laura’s Lean ground beef and I needed some more creative gluten-free dinner ideas. May have to make this recipe this week. You would love it Alisa! We love burgers and these sound incredible – love that you made your own ketchup!!! 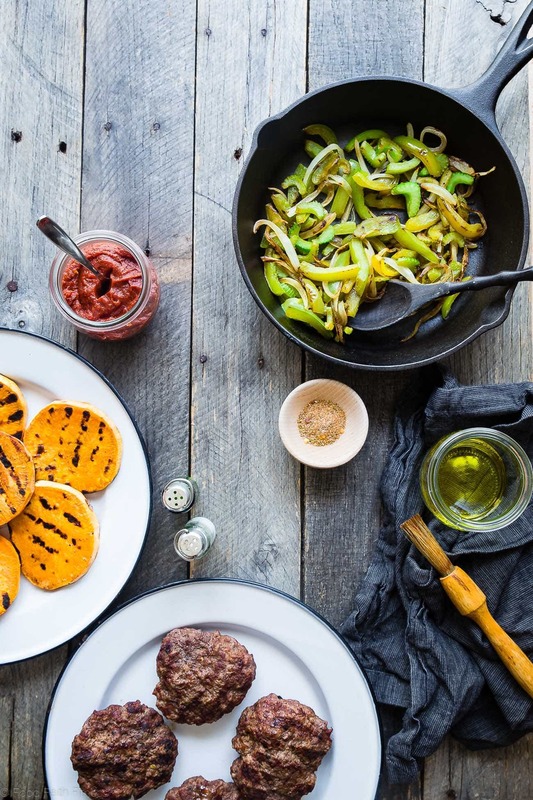 We LOVE burgers AND sweet potatoes. Best of both! That looks so delicious! I’ll have to find some larger sweet potatoes to fit the diameter of the burger! The organic ones are so tiny where I live! That’s sad!! Definitely try to find some big ones so you can try the burgers!